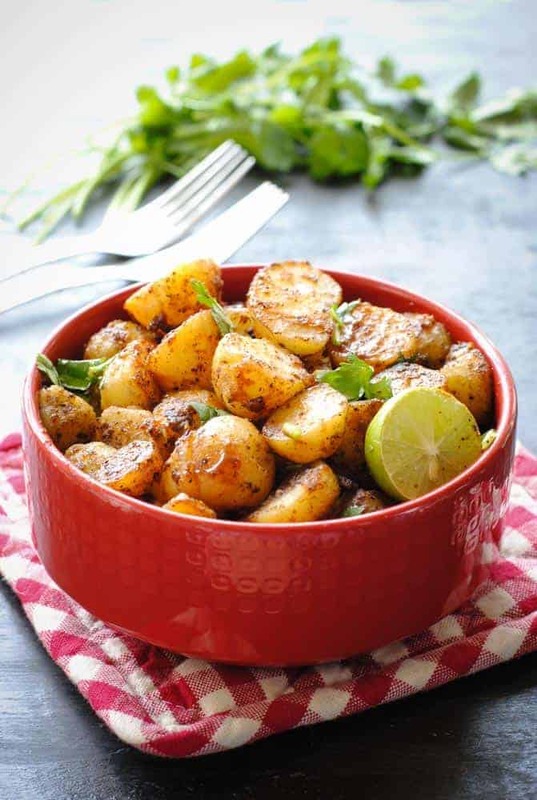 Aloo chaat is a serving of shallow fried baby potato halves in a medley of spices and a dash of tamarind chutney. Delicious! On rainy days, all that my heart desires is a good book to curl up with, a cup of tea, and… aloo chaat. 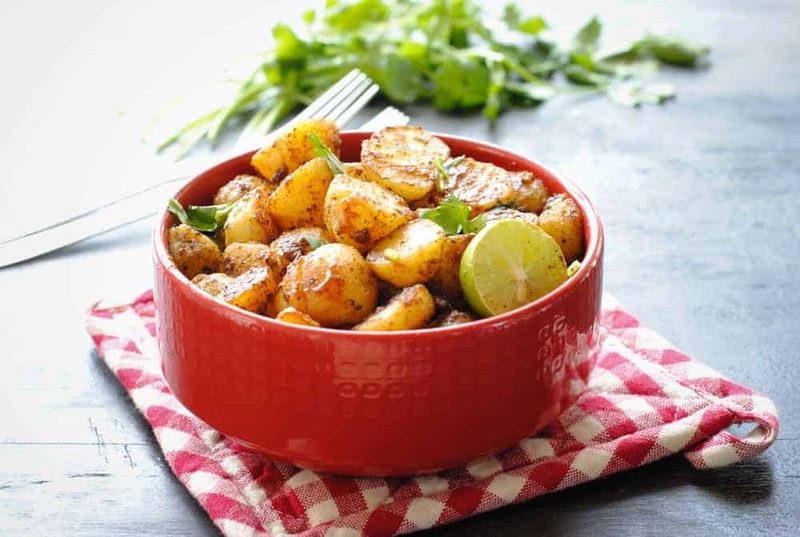 Aloo chaat is one of those snacks that is ready in a jiffy! And it is one that nobody, and I mean nobody can refuse. 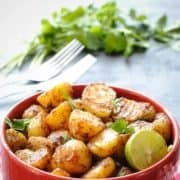 The chaat masala (a special combination of choice spices), lemon juice and tamarind give the potatoes a piquancy that is music to the taste buds. 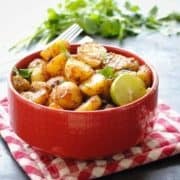 Like with everything else, there are many, many variations of aloo chaat that you will find on the internet and each one will differ in the time taken, the ingredients used, the spice level etc. Why I like my version of this popular street food is because it ticks all the right boxes. It’s easy – This is an aloo chaat recipe that almost anyone can make. No culinary skills required. Seriously. Just shallow fry some boiled baby potatoes in a cast-iron skillet and mix in a few spices and that’s it. It’s quick – How much time does it take to toss a few ingredients together? If you have boiled potatoes at hand, it’s ready in 5 minutes, tops. It’s super-tasty – I challenge you to have just one or two potato halves and stop. Once you start, you will be craving for more, so don’t be surprised if you find yourself devouring the whole bowl! Note: If you want to make your own tamarind chutney at home, here’s one by Serious Eats that goes really well with all kinds of fried snacks. But if you truly want to save time and get going, just buy some at any Indian store. It comes sealed in a glass bottle and keeps well in the fridge for a few months. I just shake out some on the potatoes straight from the bottle and I’m done. Boil, peel and halve the baby potatoes. Heat the oil in a skillet and shallow fry the potato halves till they are golden brown. As the potatoes are frying, sprinkle the black salt and chaat masala on top. Once the potatoes are fried, add the lemon juice and mix well. Arrange the baby potatoes on a plate and drizzle the tamarind chutney on top. Garnish with chopped cilantro. Black salt, chaat masala and tamarind chutney are all easily available in any Indian grocery store or even big chain supermarkets like Walmart. Black salt is a kind of rock salt that is light pink in colour. It is a commonly used ingredient in Indian cooking, especially in chaats, chutneys and raitas. Chaat masala is a combination of many powdered spices like paprika, cumin, black pepper, cardamom, cinnamon, ginger and mango powder. I recommend using a cast iron skillet for this recipe. 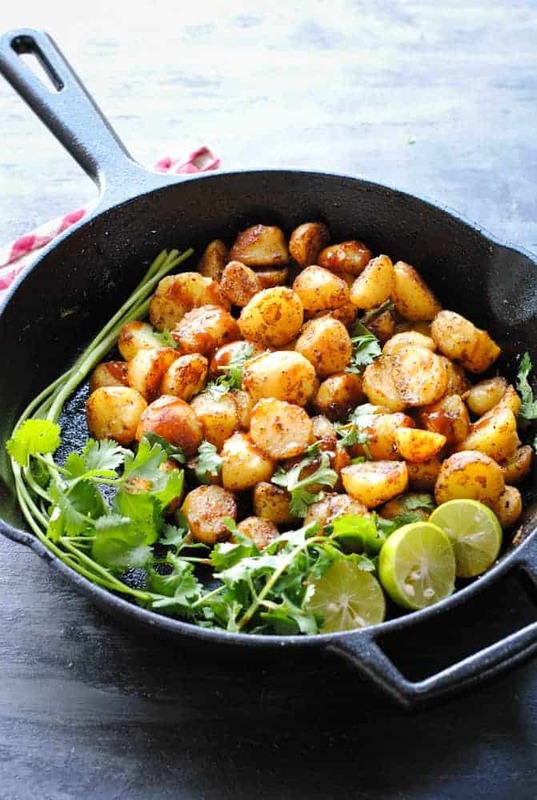 The heat is distributed more evenly in a heavy skillet and the potatoes get fried quickly with a lovely brown crust. However, if you don’t have a cast iron skillet, a regular pan works too. I love experimenting with Indian flavours. We are potato lovers in this house, so I know this would be a hit. I love cooking in my cast iron pans too. This sounds like the perfect side for so many meals. I’m doing my best to eat low carb right now, but you’re killing me with this gorgeous recipe! Potatoes are my biggest weakness, and I don’t think I could resist this salad! I love Indian potato dishes! This recipe is another great way to spice up potatoes and turn them into a spectacular side dish! YUM!! I really need to try this recipe out for dinner or a BBQ or both! I love baby potatoes, they’re my absolute favorite. I find them so much easier to cook with because you can capture more flavors. I haven’t cooked much with Indian flavors, so this recipe intrigues me. These potatoes are just irresistible! Their flavors, and the fact that they are so easy and fast to make are music to my ears. Pinned to try! For sure, Nicoletta! Do try them. These sound amazing, I agree, there is no way I would stop at just one or two. 🙂 And thanks for explaining that black salt is actually light pink in color! I am sure it’s simply my own ignorance of Indian spices and ingredients, but I had no idea that was the case, and am glad to know! Haha, yes! Sometimes names can be so misleading. I felt I had to clarify this in case someone went looking for a black looking black salt! We love trying new potato recipes so we seem to always have them on hand throughout the year. Plus, they are great to satisfy hunger as a snack and they sound super flavorful! I don’t do a lot of experimenting with Indian food but this sounds like something I need to try. I love all these flavors! OMG I have two bags of beautiful baby potatoes sitting on the counter. NOw I know what I’m making with them! These sound seriously tasty! I so love potatoes and finding new ways to prepare them, can’t wait to give this a try soon! I could seriously see myself eating this with every meal. I love potato salads like this. Your photos are great too! Thanks, Nicole. Yes, these are seriously addictive!